Fiancee: Beth A. Auslander, Ph.D. Check out my Engagement Page! If you've ever enjoyed hearing someone's funny misperceptions of song lyrics, you'll LOVE my MONDEGREENS page! Check out this SNL sound! 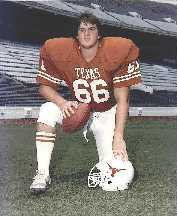 University of Texas football, where I was on the team way back in 1984! Click on the picture for the "full-size" view!